Penang is not even a couple of hours away from Singapore by plane so it is a very common destination for people looking for ‘cheap’ food and a little bit of culture. I am sure there is more to see on the island than what we experience but we too decided to focus on food and culture hence we stayed all the time in George Town. Our cultural trip started by the place we stayed in – East Indies. It is an amazingly renovated peranakan house divided into extremely spacious rooms. 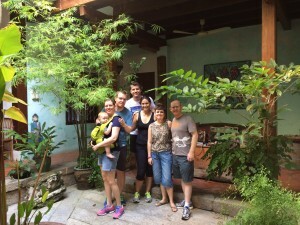 They made the place to feel as if it was your house with a lovely courtyard for relaxing and a shared kitchen. We rented a 2 bedroom apartment which had a big living room which was very convenient. Very close to our hotel was the Peranakan House Museum which was very cool to see. They have free guided tours where they explain about the nyonias and babas and other customs. The jewelry, clothes and furniture are amazing to see. Very nice place. We walked around all over George Town so we saw different temples, little shop house streets and mosques all over the place. The nicest area to find little cafes and restaurants and street art is around Armenian Street where the famous wall paintings are. They are quite nice to see but you need to keep your eyes open to see the more secluded of them. The most impressive temple of all was Khoo Kongsi because of its size and details. It was very interesting to see the European and Chinese influence merging with Malay culture in the constructions. – Tek Sen: glazed por belly is to die for! – China House: very nice set up with 3 types of restaurants, boutique and art gallery in a shop house. The desert table is incredible!